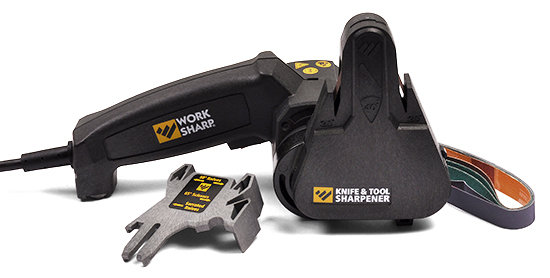 Sharpen like a pro at home, with the Work Sharp knife and tool sharpener, an innovative abrasive belt sharpening system that brings professional level sharpening into your home shop. The combination of flexible premium abrasive belts and precision sharpening guides create incredibly sharp blades with speed, ease, and repeatability. The sharpening guides are purpose-built for kitchen knives, outdoor knives (hunting knives, pocket knives, filet knives, etc. ), and scissors and serrated knives. This tool can also be used for many other sharpening tasks such as garden pruners, lawn mower blades, shovels, and countless other bladed shop and garden tools. They also make the ideal hand detail grinder for light duty grinding or de-burring tasks. The sharpener can be used with a 12V power inverter to meet your sharpening needs at your hunting camp, RV camp site, or truck's tailgate allowing you to sharpen where and when you need to (inverter not included). This tool includes a detailed User's Guide and Instructional DVD. Replacement Belts can be found here.